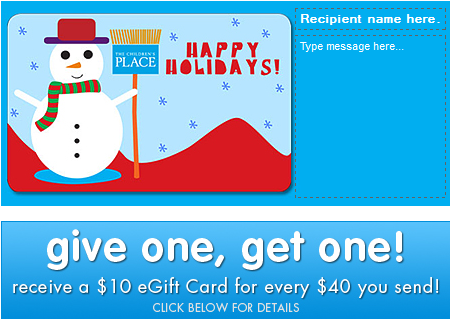 Home > Holiday Deals > The Children’s Place: Buy a $40 eGift Card, Get $10 Back! The Children’s Place: Buy a $40 eGift Card, Get $10 Back! The Children’s Place is running a fun deal just in time for the holidays – buy $40 worth of eGift cards and get a FREE $10 coupon back! These gift cards are fun because you can personalize them with a message or picture and then choose the delivery date. If you plan on buying some of your Christmas gifts at The Children’s Place, think about buying one for yourself so that you have more money to use for less cost!